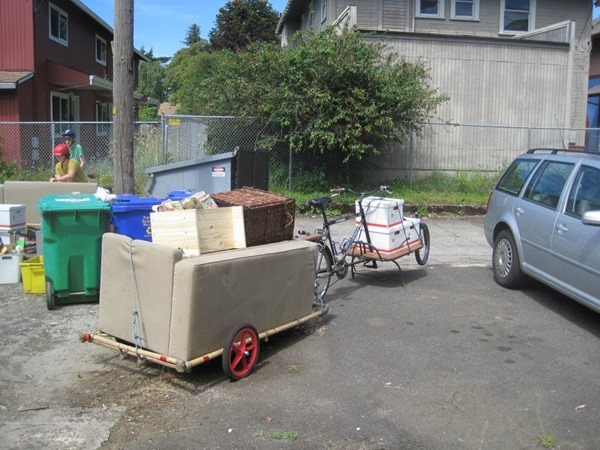 On a visit to Shanghai in 2010, I snapped dozens of photos of people transporting large objects by bicycle – including a bathtub and a full sized refrigerator – among other large household items. Here in Canada or the United States, it would be difficult to find a pizza being delivered by bike, let alone a bathtub or a fridge. That is, unless you have met Ryan Good. 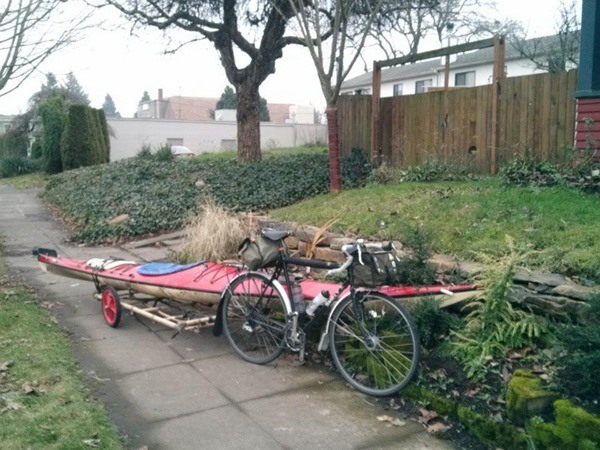 Ryan reached out after reading our “Home Depot Trip By Bicycle” article a few weeks back, sending us photos of the objects he has transported by bike. Ryan’s photos make my Home Depot trip look like a trip to the spa. Ryan lives in Portland, Oregon – one of America’s most bike-friendly cities. 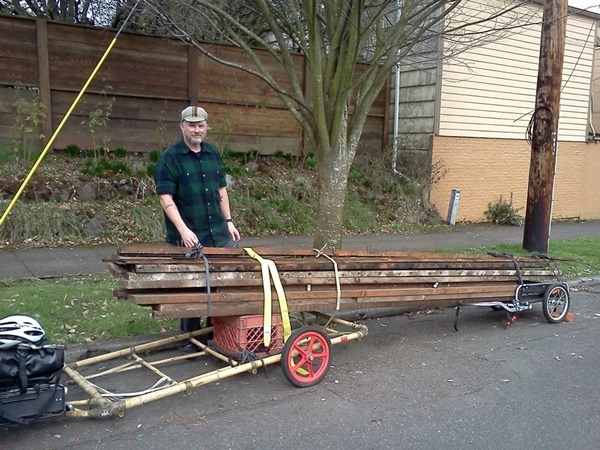 When people transport large household items in America, they would typically use a truck. But not Ryan. 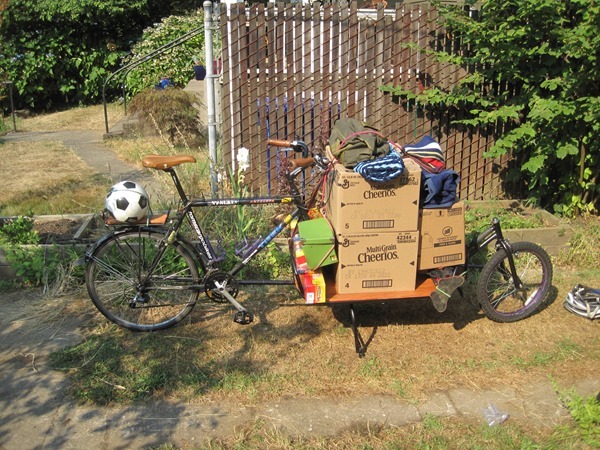 Ryan has transported heavy loads exceeding 600 pounds, all by bicycle, and he has the photos to prove it. “Steph and I live about 10k from my work, and 5k from her school (she wanted a career change and is studying massage therapy), so we find we just have no need for a car. One time, after dropping Steph off at the airport on their tandem bicycle, a minivan driver asked Ryan where the other person was. I asked Ryan how he got into carrying large objects by bicycle. He explained that in Portland, they have a listserv where people who are moving to a new home will post their planned moving date. 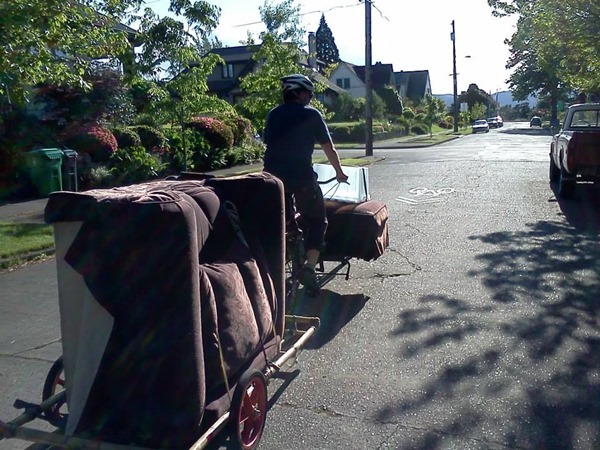 Then on moving day, 20-40 people often show up to help that person move all of their belongings, all by bike! “I went to my first one out of curiosity, and was amazed at all the different types of cargo-bikes and trailers- many of them homemade. I was also amazed at how incredibly quick and efficient it was. 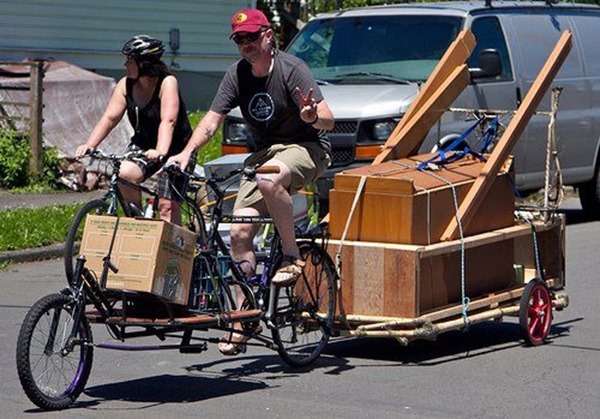 Most bike moves- and we’re talking about moving entire households- take less than two hours. Partially because of sheer numbers- when you’ve got 25 or more people, things happen fast- and partially because of the skill-level involved. 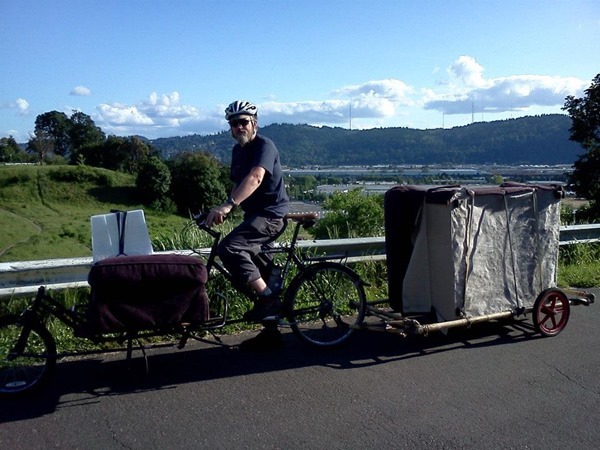 Many of us in Portland have been doing bike moves for years- I’ve been doing them for four or five years now, and I’m a relative rookie- and have had a lot of practice, so we know how to move large things efficiently. People sometimes explain to Ryan that they need a car to move furniture, do groceries etc. They say it would be “impossible” to do those things by bike. To which Ryan responds, “umm, actually…”. Portland Bike Move from Ande taylor on Vimeo. Ryan seemingly attempts to dispel our assertion in yesterday’s post that “Urban Bicycling Is For Lazy People”. Or, perhaps one could argue that people who participate in these bike moves are too lazy to rent a truck and spend their entire day moving, so they get it done in 2 hours and then sit around and drink beer and socialize for the rest of the day. As a lazy person, I wouldn’t have it any other way. Make sure to check out Ryan’s flickr gallery – “Things I Carried on my Bike”. I think I have some ideas for next time I move to a new home. Thanks, James, great article! I do move a lot of things by bike, and I’m just one of many here who do so. There are many of us who really enjoy doing it. It’s like a different kind of cargo-cult! bike moves have a long and glorious tradition in Portland. So true! Thanks for sharing that Aaron. You are one of the old school bike movers who inspired me early on! health by manually pedaling. It is a strong effective exercise.